With two pre-installed Perlick 630SS draft beer faucets and classy black iron construction, you're sure to love this double tap draft beer tower. Upgrade your atmosphere with the industrial elegance of this unique double tap draft beer tower. Both of the pre-installed draft beer faucets on this tower are premium Perlick 630SS, ensuring that you've got the pouring performance you need for your busy bar or restaurant. The black iron construction combines unbeatable functionality with a rustic, yet modern feel that's sure to add desirable character to any space. Take your pouring to bold new heights. Get your black iron draft beer tower with dual Perlick faucets now! This two faucet black iron tower was perfect for our new 'industrial modern' home bar. It compliments the black iron foot rail and shelf supports perfectly. I ordered the Perlick faucets and they work great. Definitely don't seem to get sticky after sitting for a few days. I really like it and while it was not inexpensive any good tower and faucet set is going to set you pack a bit. I chose this because I wanted an old industrial look to go with my new kitchen. Like the industrial look and the Perlick faucets! Read many reviews about you want to have Perlick Faucets. Liked the looks of the tower. What is the distance from base to centerline of faucet shank? What size hole should I drill in the counter top? BEST ANSWER: Ours is mounted above a kegerator (so it's the draft beer tower, granite, and then the kegerator. 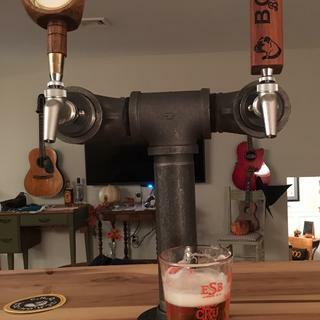 We had the counter manufacturer drill the same size hole as the kegerator's opening (I want to say it is 1.5"-2" diameter, but I'm not positive). 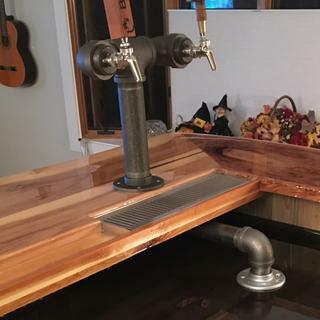 He used the beer tower base as a template to drill holes for the screws to attach the tower to the counter and used his anchors that are used for under-mount sinks to have a place to securely attach the tower to the countertop. We were unable to use the screws provided to install as they were too long, but found standard screws that worked just as well. Honestly the hole size doesn't need to be very large, just large enough for the beer lines to fit through. Hope that helps. First i wouldn't drill a hole until you get the tower. It has two plastic tubes coming out of it so your looking as least 1 1/2 to 2 hole. There are also 4 mounting hole that have to be drilled. Love the unit but I would wait until you receive the tower. I drilled an inch and a half hole.. That was enough to fit the two tap lines and some copper pipe insulation. Can you use a glycol system with this tower? BEST ANSWER: This item can be customized for a glycol system. Please contact our sales team at 866-881-BEER or email beer@kegworks.com for a quote! How does the black iron beer tower mount to the bar top? BEST ANSWER: Hi Ryan, the base of the tower is a flange with 4 screw holes. You screw the tower directly to the bar top with the appropriate size and type hardware for your countertop surface. Cheers! Thank you for your quick response. I'm not an expert but most beer towers I've looked at have had a 2.5 - 3 inch treaded shank to go through the bar top and a nut to tighten it down on the other side. I have a nice 12 foot oak bar in my house and I don't like the idea of putting 4 screws through the top of it to mount this tower. If for some reason I would ever change beer towere I would be left with 4 holes in my bar top. And this is a 6.5 inch flange so there wouldn't be any good way to hide the holes. Do you guys have any alternative way to mount this beer tower? Hi Ryan, you're very welcome. I spoke with our product manager and he confirmed that the only way to attach this tower is by screwing the flange directly to the bar top. Your bar top sounds beautiful so I can understand the hesitation of putting screws right through the top. It looks like you're interested in a double tap tower. We do have a double tap style that mounts with a shank and nut like you described. It's called the Mongoose Draft Beer Tower. It's a very different look than the Black Iron but I wanted to offer it as an alternative in case you're interested. Please let me know if you have any other questions. Cheers!